OP-EZY Lossless YouTube to iPod Converter is a front-end to a collection of open source programs which allow you to convert videos downloaded off youtube to be imported to iTunes and synced with your iDevice. It is also useful for converting YouTube videos to a format that’s easier to play on your computer. The main function of this program is to strip the audio from music videos to be used as a standalone audio file. 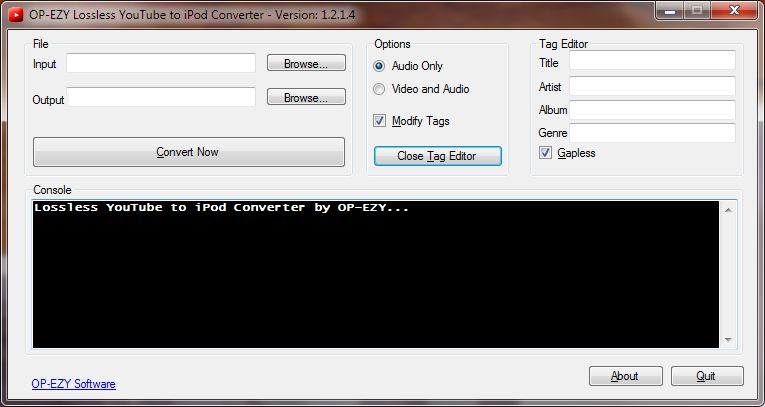 There is also a basic tag editor to allow for easy integration into a music library. There is also an option to convert video to video, which is useful for content downloaded in the .flv format. The program requires the .NET framework 2.0 to be installed. There are two versions you can download, the complete version which contains the binaries needed to do conversions, and a barebone version, which you can use if you want to use the most up to date tools to do the conversion. More information in the Readme file included.